An early power play goal got things going for the Golden Knights. Ryan Reaves put home an excellent pass in front of the goal from Cody Eakin. Then the game started to get a bit ugly as the hitting rained down all over the ice. Reaves lit up Tom Wilson, Alex Ovechkin destroyed Tomas Nosek, and William Carrier was hitting everything that moved. During it all, Washington took the lead back. 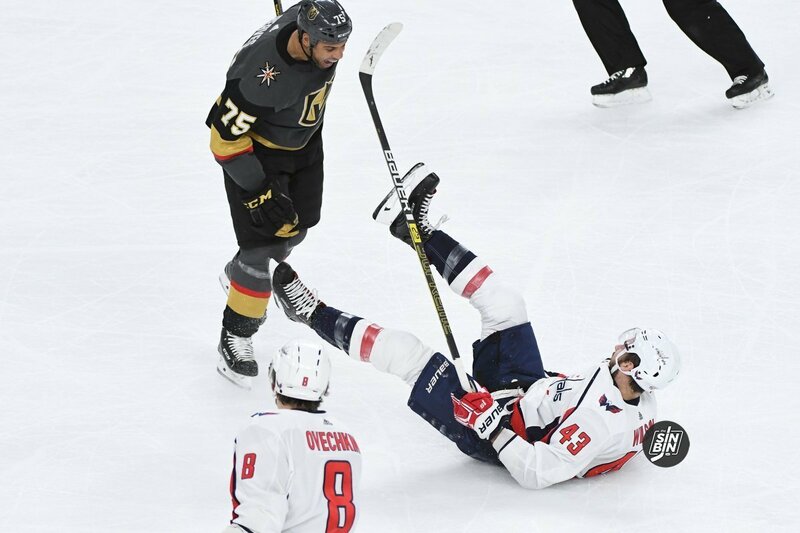 The Golden Knights killed the 5-minute major penalty that sent Reaves to the showers for hitting Tom Wilson. Then. Vegas scored twice in 16 seconds to regain the lead. Nate Schmidt scored late in a 4-minute power play to give the Golden Knights the lead very late in the 3rd and then Schmidt nailed the empty netter to seal it. The game of the year in the NHL to this point. Upcoming stories from the Vegas Golden Knights vs Washington Capitals at T-Mobile Arena. Carp’s column on Seattle expansion, including quotes from Foley on taking the exemption over the money. Golden Knights win the Game of the Year 5-3. Nate Schmidt with the game-winner and the empty netter to seal the deal. VGK penalty killing deserves the 1st star of the night. Maybe the 2nd and 3rd too. Unreal job by every PKer tonight. Say what you will about Tom Wilson, it’s awful to see a crowd boo an injured player.